The First Purge serves its purpose as a politically driven action thriller that still manages to offer an optimistic viewpoint in the age of Donald Trump. Starring Y’lan Noel, Lex Scott Davis, and Marisa Tomei, among others, The First Purge explores the events leading up to the government first permitting Americans to kill each other for sport one night out of the year and the bloodbath that occurred during that fateful evening. With the exception of Tomei, who plays the psychologist responsible for developing the experiment we know as “The Purge,” most of the cast is relatively unknown (at least to me). Noel and Davis are effective leads as a drug kingpin turned action hero (affectionately referred to as Black Rambo by the couple sitting next to me in the theatre) and a political activist doing her best to mobilize her community against The Purge (respectively). The rest of the cast is mostly forgettable — aside from Rotimi Paul as Purge enthusiast Skeletor — but they serve their purposes. Frank Grillo’s Sergeant Leo Barnes is noticeably absent during the first half of the movie, but his presence here would’ve made little to no sense, and I stopped missing him once the action got going anyway. Gerard McMurray’s prequel is also a stark contrast from the other three movies in the franchise. The original The Purge, The Purge: Anarchy, and The Purge: Election Year all portray Purge Night as something a lot of Americans look forward to participating in. However, The First Purge optimistically responds by stating that even the communities with the most to be angry about want nothing to do with this government-sanctioned massacre. In fact, during the movie, the New Founding Fathers of America (a political party that takes all of the worst qualities of today’s Republicans and makes them mainstream) has to send kill squads into Staten Island to skew the results of the experiment so they can sell The Purge on a nationwide scale. The First Purge definitely leans more into the action elements of the franchise most prevalent in Anarchy, but also has some well-utilized jump scares like The Purge. While it doesn’t unseat Anarchy as the best movie in the franchise, it is better than the original and an immense improvement over the lackluster Election Year. 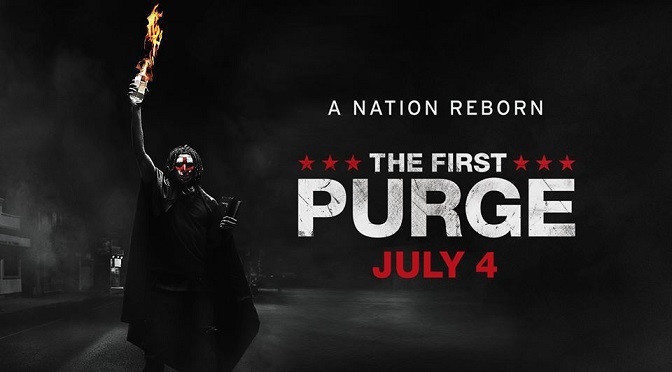 The First Purge – with 2.5 out of 5 American flags – hits theatres on Wednesday, July 4, 2018.